Pipeline workers probe the ground on Lisa Drive in West Whiteland Township where sinkholes have developed as a result of the Mariner East 2 construction. Vandalism to pipeline construction equipment nearby has garnered two separate $10,000 rewards. Two separate $10,000 rewards are now offered for information on who vandalized a backhoe and bulldozer last week in West Whiteland Township, Chester County. The damaged construction equipment belongs to Sunoco/Energy Transfer Partners, which is building the controversial Mariner East 2 pipeline through the township. Sunoco announced its $10,000 reward last week, and pointed the finger at environmental activists. This week, the Middletown Coalition of Community Safety, a group critical of the Mariner East pipelines, has offered its own $10,000 reward, positing the damage could have been self-inflicted by Sunoco to “change the conversation” about the pipeline. Neither group has direct evidence for their competing claims. Friedman says the heavy security presence on the pipeline route makes him wonder how this vandalism happened. He is a vocal critic of the Mariner East 2 pipeline, raising issues surrounding eminent domain as well as the safety of natural gas liquids traveling through densely populated areas. Energy Transfer Partners/Sunoco spokeswoman Lisa Dillinger rejected the Coalition’s speculation that the pipeline company would have damaged its own equipment. “It is silly to think we would damage our own equipment and it is unequivocally not true,” wrote Dillinger in an email. The security on the pipeline route, she said, is for the safety of Sunoco’s workers and people who live and work near the construction site. West Whiteland Township police chief Joseph Catov Jr. said the investigation is still open. Last week, Catov said the vandals cut hydraulic and fuel lines and some wiring, tried to seal the cab of one vehicle using silicone, and may have poured sand into a diesel tank.The damage occurred April 2 and 3, Sunoco said. A year ago, two activists with the Catholic Worker movement admitted to damaging Energy Transfer Partners’ Dakota Access pipeline in Iowa. The company has made similar allegations against activists in the past. Last August Energy Transfer Partners told the Federal Energy Regulatory Commission that pipeline opponents were to blame for adding diesel fuel to 2 million gallons of drilling fluid that spilled into Ohio’s Tuscarawas River wetland during construction of the Rover pipeline. Ohio authorities said the diesel fuel was present in a number of locations where the company’s drilling mud entered the wetland. 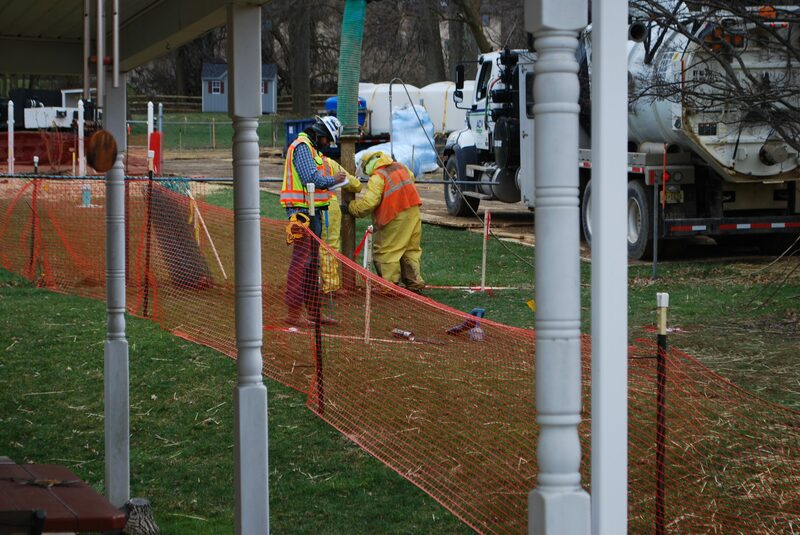 ETP/Sunoco’s pipeline construction has damaged well water in Chester County and created sinkholes, leading to greater opposition among residents.